Local resources. Inspiring stories. Good advice. Whether it’s physical, financial, professional or pyschological, obstacles come in all shapes and sizes. And no matter who you are, everybody goes through tough times in their lives. Lifestyle Citizens’ founder Josh Martin was 28 year old when he experienced his biggest obstacle yet: an aggressive form of leukemia. He survived, and although it was a gruelling ordeal, having cancer taught him a lot about resilience and overcoming whatever obstacles life throws at us. 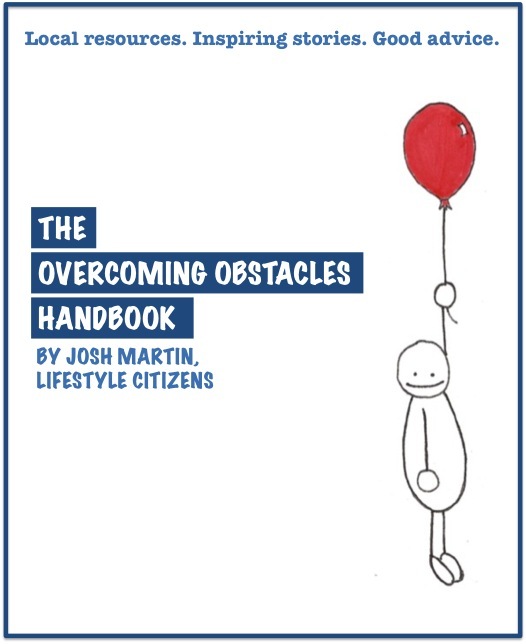 Inspired by his journey, the Overcoming Obstacles Handbook is a free collection of real-life stories, practical advice and local resources in the Winnipeg community geared at helping people overcome obstacles. One of the most important lessons Josh learned from his health crisis was the importance of community. Whether it was accessing peer support programs, using the Cancer Society’s shuttle service to get to appointments or tapping into educational materials from the Leukemia & Lymphoma Society, community resources played a big role in his success. Whatever obstacle you face in life — personally, professionally or otherwise — be sure to consider the resources available in your community. Fortunately, the Winnipeg area boasts all kinds of organizations and programs focused on helping folks overcome a variety of obstacles. Below, you’ll find information about some of them. This listing is by no means exhaustive, but it will hopefully give you a flavour of the kinds of resources available in your own backyard. This edition of the Overcoming Obstacles Handbook is made possible by the generous support of the following local businesses. Experienced therapists providing individual, couples, family, play therapy, EMDR, and life coaching services 7 days per week. Convenient on-line booking option. Team G-FIT provides Fitness Coaching to individuals looking to improve health and reach their fitness goals, creating nutrition and exercise plans, specifically tailored for you! Natural medicine can help minimize the negative effects of conventional therapy, and improve quality of life. Let our highly trained doctors be your guide. D'Arcy Bain Physiotherapy has been helping our community with rehabilitation since 1981. We have expanded our services to now offer CANCER REHABILITATION and VESTIBULAR REHABILITATION.